The residents are unanimous: North Los Altos has it all. An ideal location between Palo Alto and Mountain View, a quaint downtown with many restaurants and shops, a community center, great public schools…all within walking distance. If most homes in North Los Altos are ranch-style houses averaging 2,000 square-feet, the neighborhood also incorporates Old Los Altos, a prestigious neighborhood featuring charming houses with bigger lots (5,000 to 7,000 square feet), and some houses close to 100 years old. Residents here also enjoy going to the Village Court Shopping Center, with its unique blend of restaurants and small boutiques located at the border of Mountain View. More recently, North Los Altos has become home to new apartment buildings, built along with the renovation of the San Antonio Shopping Center on San Antonio Road. Old and new residents alike can now enjoy many new restaurants and a new Safeway. 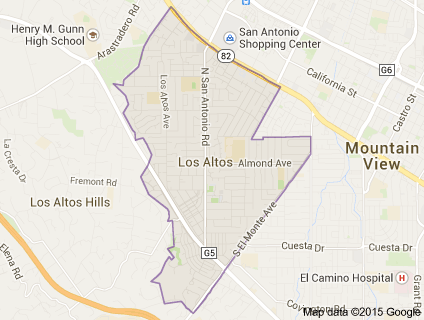 North Los Altos used to be pastureland and orchards. Today the Los Altos History Museum is home to the last active apricot orchards. - Children's Corner, 97 Hillview Ave.
- Children's Creative Learning Center, 700 Los Altos Ave.
- Los Altos Christian School, 625 Magdalena Ave.
- Canterbury Christian School, 101 N. El Monte Ave.
- Shoup Park, 400 University Ave.
- No. 15, 10 Almond Ave.